Mac Andre Arboleda's second solo exhibit "The Face of a Marcos Apologist" opens on July 21, 2018, Saturday, 6PM at Nomina Nuda, Los Baños, Laguna. The project, first released as a black-and-white zine under Asshulz, now presents itself in an exhibition setting with music by 帰宅します, Amado. About "The Face of a Marcos Apologist"
Selfies compatible to facial recognition system have been fed to an online portrait morphing software, resulting in the composite image the project calls “the average face of a Marcos apologist.” Mac Andre Arboleda selects data and puts them together in a singular space, allowing the viewer to pay closer attention to what would otherwise have been internet debris, and the smartphone self-portraits that have become the symbol of millennial narcissism and construction of personas on social media are transformed into artifacts of a moment in internet history: Publicity Asia’s 2016 Twitter contest #WinADateWithSandro that promised 12 best selfie submissions a date with the grandson of the late dictator Ferdinand Marcos. The artist’s ‘curation’ through found images is an insistence on memorializing what is absent here, the unmemorialized. We are asked to suffer the pouting faces and casual poses and mull over their number and namelessness. The deluge of these ephemeral but persistent selfies instigated by a campaign to erase Marcos atrocities from public memory underscore the irony in view of the over 1600 individuals that were disappeared during the Marcos regime: the immediate face, an unwitting trace of the vanished one. First released as a black-and-white zine, the images that comprise this project traverse from digital self-portraiture to social media to print, and finally to an exhibition setting, accumulating several contexts over being mere selfies as proof of adolescent desire—snapshots of oneself by oneself documenting current personal affairs but also intending to build up ideal selves in social networks, originally shared as nothing more than oblivious confessions of a crush. The pictures reveal much of how the owners of the selfies perceive themselves and wish themselves to be perceived, while also obscuring the nature of this desire, how it has taken root in them because and in spite of their milieus, and in the midst of the current push for historical fact-checking. See the colegiala, the middle-aged woman, the gay boy, the high schooler in her uniform; see the bed selfie, the selfie in extreme close-up, the selfie in black and white, or the one with a virtual flower crown or with a superimposed quote. These faces in no way accurately represent any one social group, nor do they accurately sample the Philippine society at present. Instead, Arboleda’s project uncovers the convenient mask of immateriality to reveal a diverse demographic of those who continue to excuse the Marcos atrocities, suggesting that what is average in “the average face of a Marcos apologist” is not always physical or easily social, and that anyone is not fully exempt from the various tendencies to be complicit to the machinery of Marcos ‘revisionism’, regardless of degree and regardless how virtual or oblique the relationship, or how removed the love object is in terms of lineage or direct culpability, and regardless of all our imperfections, contradictions, and ‘innocent' longings. The Face of a Marcos Apologist transforms these presences, perhaps knowable only in the cloud of online anonymity and comment section cacophony, into separate identities as they are encountered, experienced, and processed virtually. 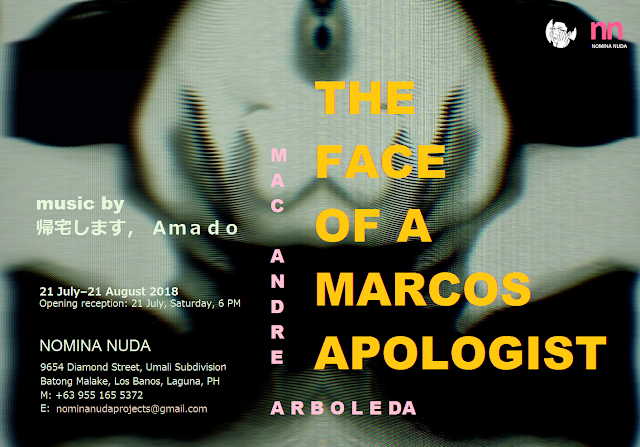 The artist presents us with the ‘average face’ of a Marcos apologist as proof of the intricacies of digital media’s intervention in personal desires and the construction of histories, making visible the faces of our material and virtual narratives so we see beyond faces.